I run past him almost every day. He stands at the corner of the intersection I cross to get to the greenbelt for my daily run. He’s depressingly cheerful. He likes to high five me. And he always wears a dress. I think about him a lot, the endless symbolism running a loop in my head like intervals on the track. I assume he’s desperately poor. He’s either Hispanic or Pima, two groups we try so hard to repress. 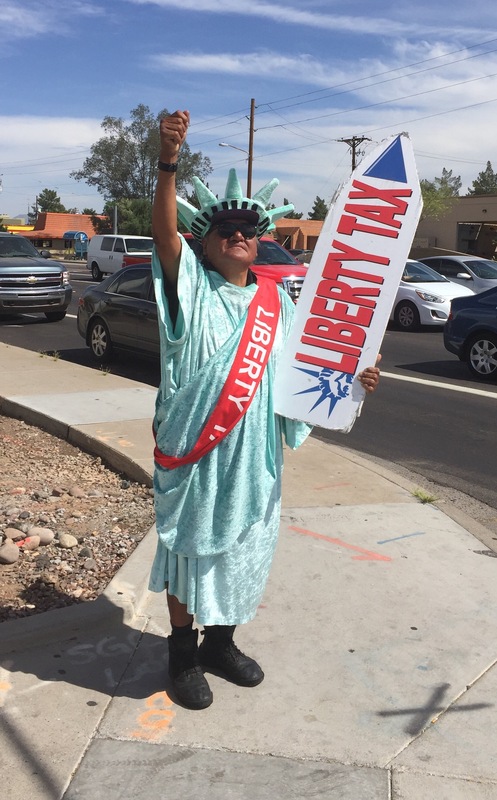 He’s posing as the Statue of Liberty while pushing a tax service. Ironic, even in the Marty Cortinas sense of the word. And still, he seems happy. I finally stop today for a photo. I’ve tried to shoot him guerrilla-style for a long time, but it doesn’t work. I worry that he’ll take it the wrong way that I want a photo. But he seems OK with it. I shoot, we high five, I start to run again. Then I hear a “hey!” and turn around. He has struck a pose. The Lady Liberty pose. He has one fist raised where the torch would be, and the advertisement has become his tablet. It strikes me that whether intentional or not, it’s the perfect rebellion pose. Fist clenched, defiant, surviving in a world where it’s increasingly difficult for the marginalized. But I LIKE margarine. I take the photo, say thanks again and head off on my run. I go past rich golfers, frisbee players, dog walkers, retirees on bikes. People with privilege, with money, with no fear of the future. It’s a different world on the greenbelt. A safe one. They say Congress would pass meaningful health care reform if they were forced to have the same insurance as the rest of us. Maybe if rich people had to spend eight hours on a hot day standing on a corner in a dress twirling a sign, things would change. Or at least I’d be entertained. But the world fails to change in the hour and a half it takes for the mad dog loop run. I come back by and he’s still there. “There’s the man of the hour!” he exclaims as I come by. I smile and wave. He goes back to twirling. I worry about all of us. I worry that the torch is fading. Or maybe it was never there at all. This entry was posted in running and tagged life, running, yellow brick road. Bookmark the permalink. In my first 6 months on the suicide crisis hotline my 40 hour weeks have consisted of over 2,400 calls, I too am worried that “American Dream” is a thing of the past. I totally love this guy. God bless the real America… the one without the superbowl. Life is funny… but also sad.